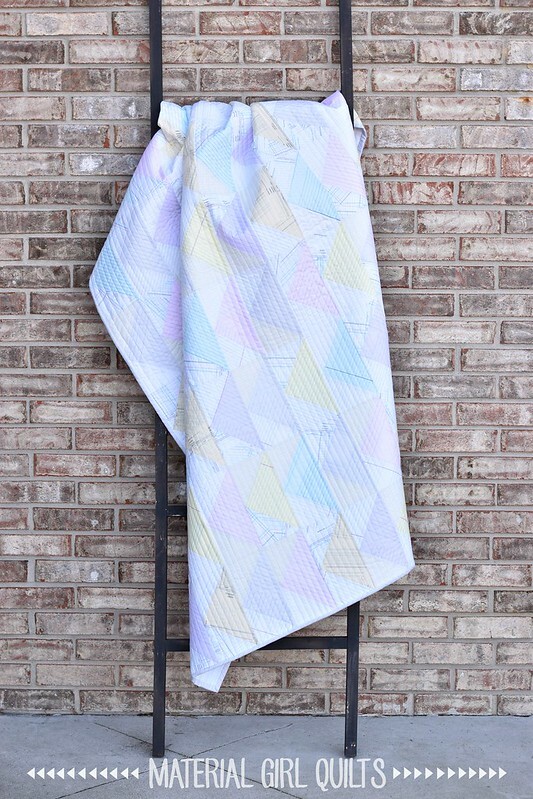 All of these low volume prints together make such a soft and sweet quilt. When I finished the quilting, I just couldn’t stop staring at it – it’s so pretty!! Below is a little closer look at some of the prints. I opted to go scrappy on these flying geese blocks, so none of them have matching background triangles. I love the movement it creates in the quilt. For the backing, I pieced together two of the graph paper prints and finished off the binding with the lovely gray paper print that is reminiscent of what I used in elementary school while learning how to write my letters. It was not easy to photograph this quilt and get the colors/shades accurate. I took a stupid amount of photos trying to get it correct, but I think these represent the true tone/color of the fabrics well. 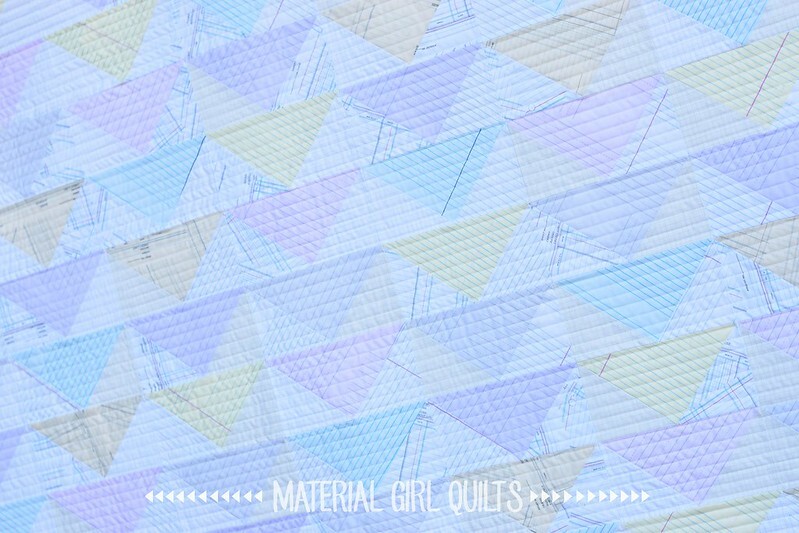 Also, check out how cute my quilt label looks on this one – LOVE IT! Now I can’t stop staring at the photos! It’s just so sweet. I think I need to make more low volume only quilts. 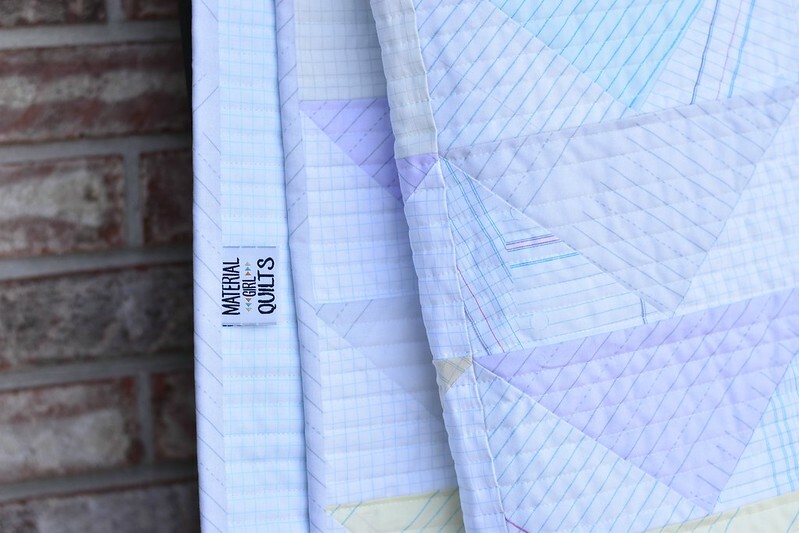 Below is everything you need to know to make a 48″ x 64″ Quiet Flight quilt of your own. From the background fabric, cut twelve (12) 4 7/8″ x WOF strips and sub-cut into ninety six (96) 4 7/8″ squares. From the geese fabric, cut six (6) 9 1/4″ x WOF strips and sub-cut into twenty four (24) 9 1/4″ squares. Select one 9 1/4” geese fabric square and four 4 7/8” background squares. With RST, place two of the background squares on the larger geese fabric square as shown. Using a ruler, draw a diagonal line from the top left corner to the bottom right corner. Stitch 1/4” on each side of the drawn line. Cut apart directly on the drawn diagonal line. Press seams toward your background fabric. With RST, place one 4 7/8” background square on the sewn unit as shown below and using a ruler, draw a diagonal line on the back of the background square. Stitch 1/4″ on each side of the drawn line. Cut apart directly on the drawn diagonal line. Press open. Repeat steps 7 through 10 with the remaining unit and background square. This will result in 4 completed flying geese blocks. Press your 4 completed geese toward the background fabric. Repeat to make a total of ninety six (96) 4 1/2” x 8 1/2” large flying geese blocks. Using the diagram below, sew together your geese into 12 rows of 8 blocks each. Press the seams open between each block and row to help the quilt top lay flat. Cut backing fabric into two 54” x WOF lengths and sew together to make a quilt backing approximately 54” x 80”. 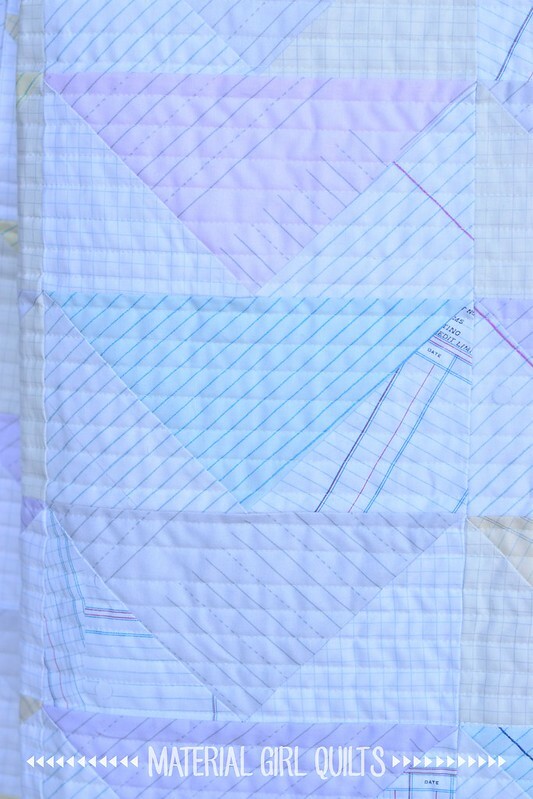 Make a quilt sandwich with the quilt top, batting and backing and baste. Machine or hand quilt as desired. Bind using 5 strips of fabric cut 2 1/2” x WOF stitched end to end. If you end up making your own version, please tag me on social media and use the hashtag #quietflightquilt (I’d love to see what you make!). Your quilt is lovely, thank you for sharing! Can you tell me where you get your quilt labels? 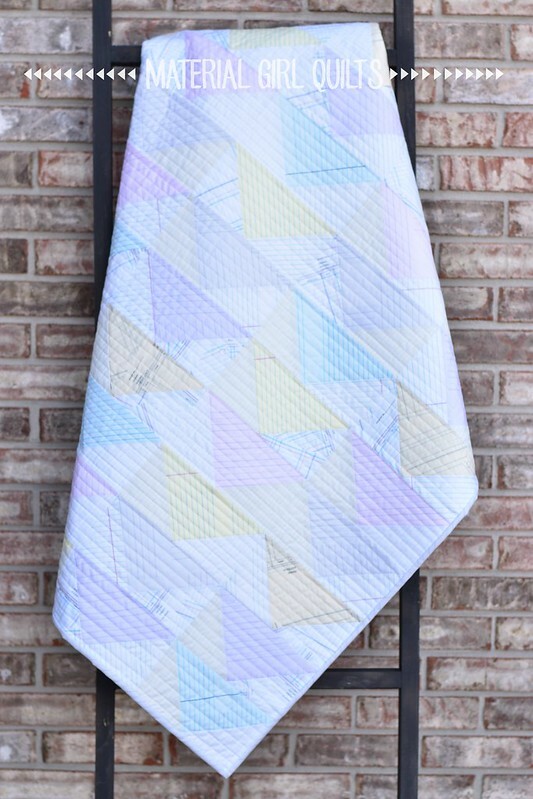 I like the soft, cool colors of this quilt. It’s relaxing just looking at it. I know they are flying geese but they look like envelopes to me. Great job! Love everything about this quilt. Thank you for creating a tutorial. I’ll be looking for this fabric so I can make a version!